Turn your wheels to the left. Turn your wheels to the right. Pull up even with the car in front of your desired parking space. After finding a parking space, checking traffic, and signaling, you should stop parallel to the vehicle directly ahead of your desired parking space before turning your wheel to park. Construction workers on or near the roadway. Warning signs are usually diamond-shaped with black markings on a yellow background. They alert drivers to upcoming hazards. 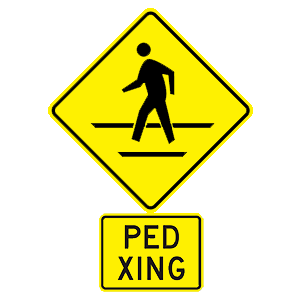 This sign indicates that there may be pedestrians crossing the road ahead. Which of the following lights indicates that you should slow down and proceed with caution at an intersection? A flashing yellow traffic light at an intersection indicates that drivers must slow down, proceed with caution, and be prepared to stop. The same full lane width as other motor vehicles. Half the width of a lane. Lane usage for the motorcyclist is critical. Motorcycles are entitled to the same full lane width as all other vehicles. Are always aware of the risks they are taking. Do not have sufficient control over their bodies and minds or the vehicles being driven. Are better drivers because they are more careful than sober drivers. Alcohol is a depressant that negatively affects judgment, vision, concentration, understanding of reality, and reaction time. It is never safe to consume alcohol in any amount before getting behind the wheel of a car. A steady yellow traffic light indicates that the light will soon change to red. You should be prepared to stop for the red light, if it is safe to do so.